This patient has hemoglobin SC disease, with hemoglobin S and hemoglobin C both present. With SC disease, the RBC's may sickle, but not as commonly as with Hemoglobin SS disease. The hemoglobin C leads to the formation of "target" cells--RBC's that have a central reddish dot. 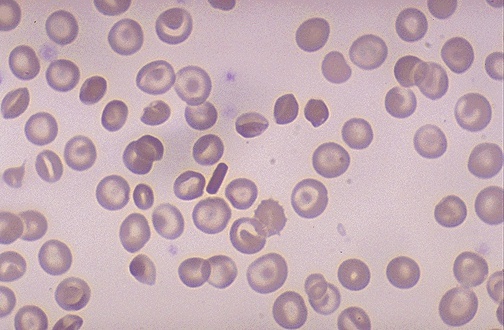 In the center of the field is a rectangular RBC that is indicative of a hemoglobin C crystal, which is also characteristic for hemoglobin C disease.